For the last couple of months, these sort of brushes have been the hot topic regarding brushes. People have been going crazy for these new Oval Brushes, I think partly because they are a completely different form of brushes but also because they look so FUN to use!!! When I first heard about these brushes I was like “They literally look so uncomfortable and hard to use” since owning a pair of these brushes, I think the opposite. I absolutely love Revolution makeup, they are very affordable and have products for everyone. I have multiple of their palettes as they have such good pigmentation, are easy to pick up from Superdrug and are all around great products. I would definitely recommend anyone to atleast try their products if you havent already, and I guarantee that you will love them! 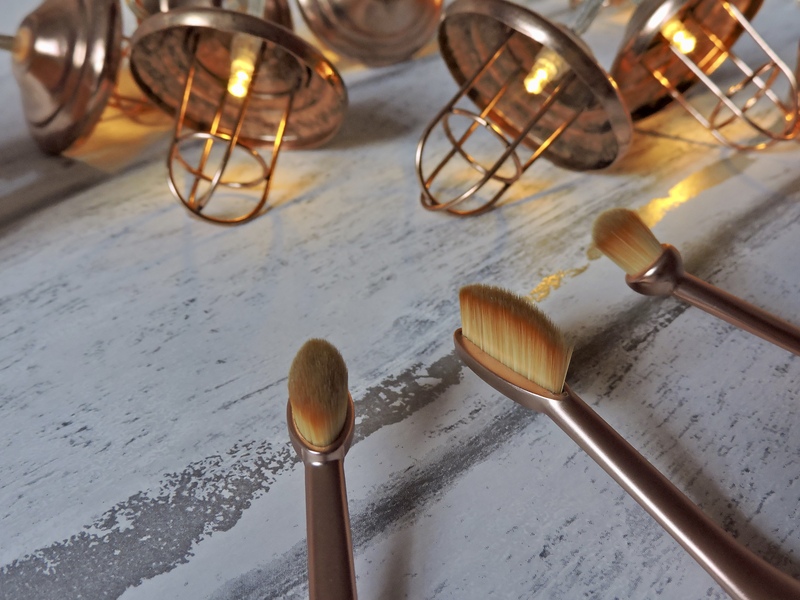 Revolution released their own Oval brushes that hit Superdrug a white ago now. They have a mixer of face brushes and eye brushes, something that with suit everyone. 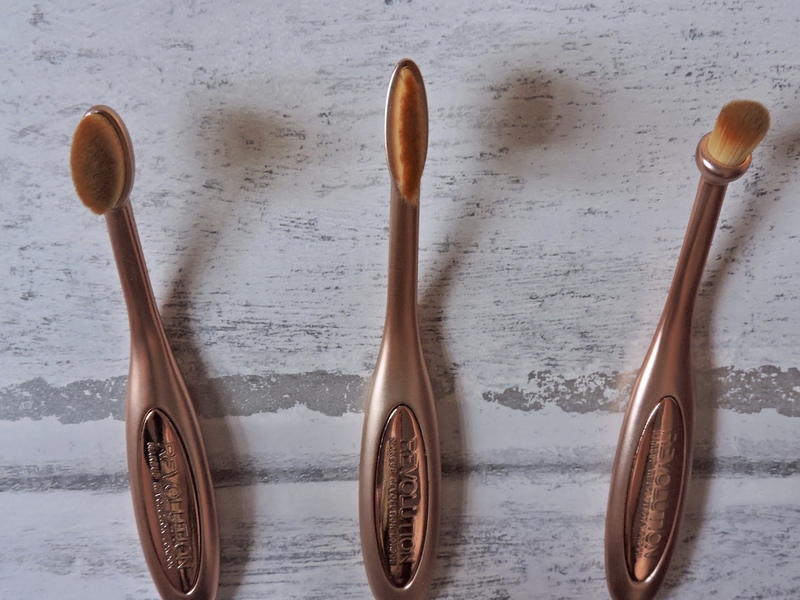 I have the Precision Eye Brush Set and inside you get three stunning, rose gold brushes. They are £14.99, which is AMAZING to me. You can buy the Oval Eye Brush (£5.99) the Round Blending Brush (£4.99) and the Eyeliner Brush (£4.99) separate, but I personally think getting the set is much better. 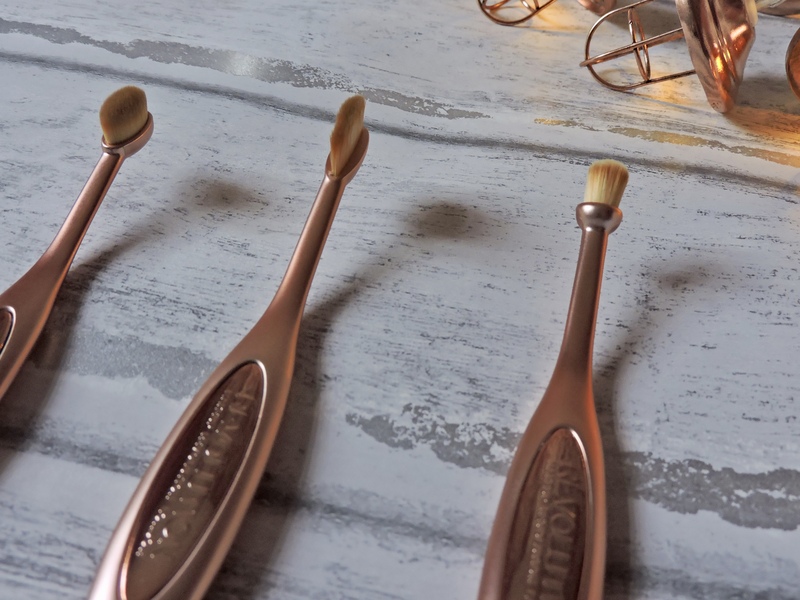 The brushes are made from plastic, they are rose gold (which is a winner with everyone ) and it has the Revolution logo embedded on both the front and back of the handle. They are very handy if you are travelling as they are light and slim. The handle is slightly tilted, so it gives you a nice firm grip to really rub any product on to your face. The brushes themselves are really soft and hold the product really well. I am not going to lie, it does take some getting use to using the brushes as they are different from normal brushes. You have to be really into wanting to use them, or you will just leave your makeup mid way and use a normal brush. The packaging of the box is very simple black, it has a plastic window so you can see what the brushes look like. 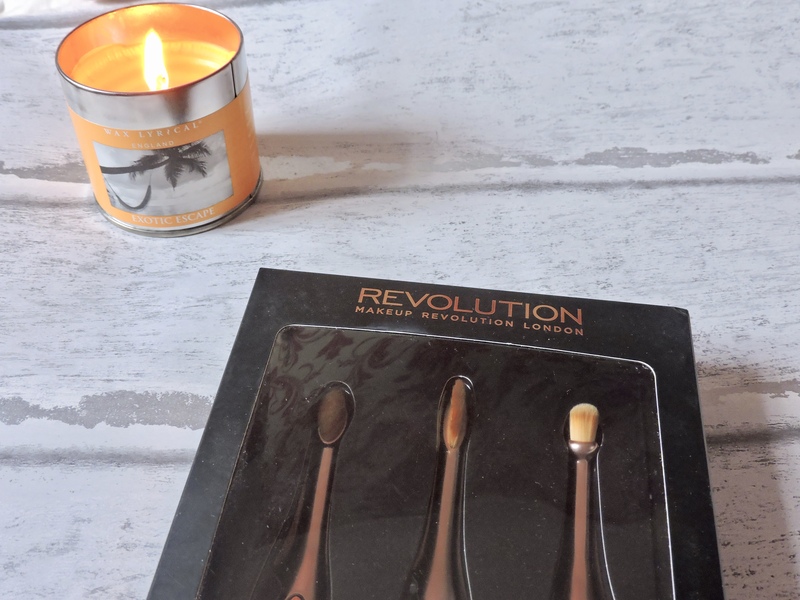 If you have used Revolution products before then you will know that this packaging is pretty standard for them as it has their iconic rose gold writing on it. The brushes inside are firmly embedded inside the tray to the shape of the brushes so they have to be pulled out. On the back of the box it tells you how the brushes are supposed to be used, but I find them very versatile and can use them of anything. I never really stick to how you are supposed to use brushes as I always find they work better for different things. Oval Eye Brush- This brush is meant to be used to blend both powder and cream shadows, also offering precision. This brush is definitely the bigger brush out of the set and the one I will probably use the most. I use this brush to blend in my contour around my face and I use it in circular motions as it blends the product really well. Eyeliner Brush- This brush is meant to be used to create precise application of eye liner. I don’t really use eyeliner, therefore I dont use it as an eyeliner brush. I use this brush apply the contour lines around my face and down my nose, it is good as it gives you a precise contour. I find this easier to use this then a normal brush. If you are keen on eyeliner then this would be really nice for you. Round Blending Eye Brush- this brush offers the same as the Oval brush, a flexible application offering precision. This brush is really handy and I use it for anything. I use it to blend in my concealer under my eyes and then applying the setting powder under my eyes. It is also really great for applying highlighter under my brows as it is the perfect circular shape for getting right under the brow. I also use this to blend the contour on my nose. 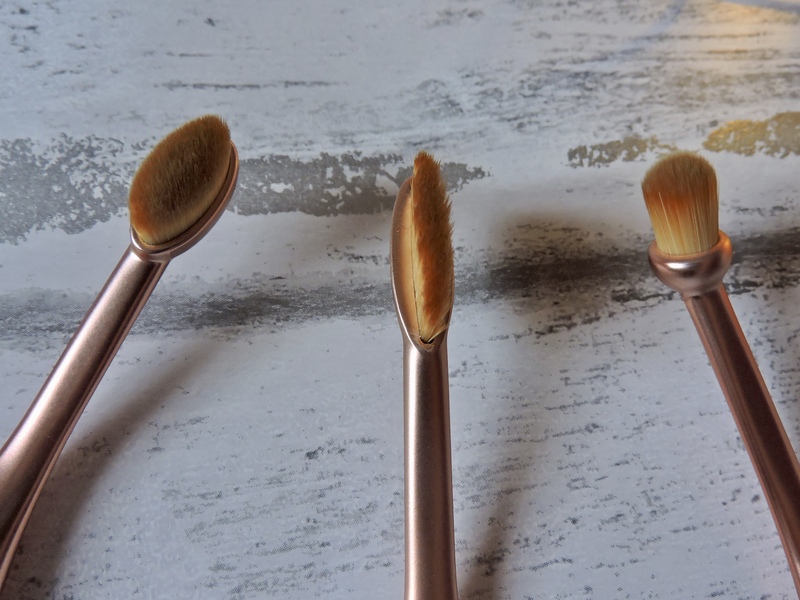 The brush is small and is perfect for applying product on to the smaller parts of your face. Overall, I really like these brushes. They come in handy and can be used for anything. 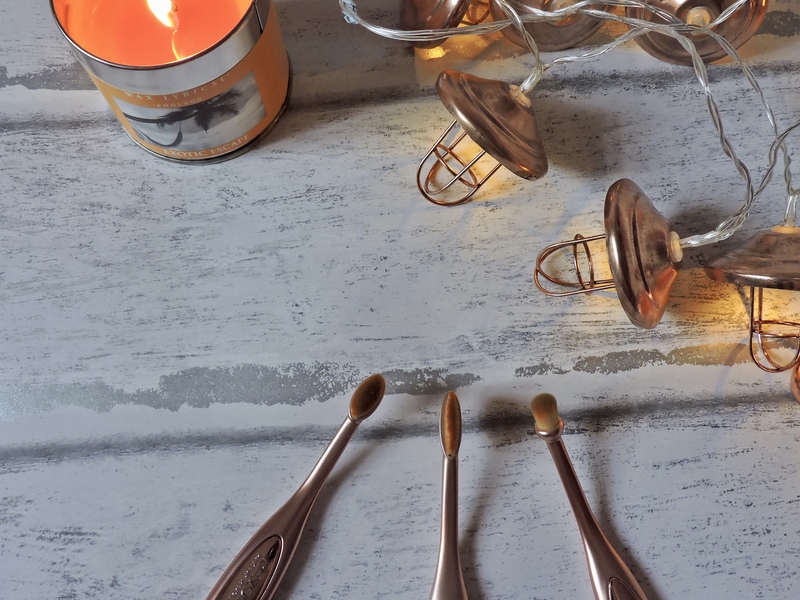 If you are looking for new brushes then I would definitely recommend these! it does take some time getting used to using them, but once you have the hang of it they are great to use. Do you own any Revolution products? Is there anything you would recommend?? Next Post REVIEW: Too Faced Chocolate Bar Palette! I’m definitely gonna have to buy some ASAP. I’ve always contemplated these brushes but they look so hard to use! Very good information. Lucky me I recently found your site by accident (stumbleupon). I have book marked it for later! I’m very happy to uncover this page. I wanted to thank you for your time due to this fantastic read!! I definitely enjoyed every bit of it and I have you saved as a favorite to check out new stuff in your blog.